This review of Hellboy was originally published at Christianity Today in April 2004. Some superheroes focus on settling a score. Some learn lessons about responsibility, talent, and weakness. But for some, like Hellboy, being a superhero is just a job. For director Guillermo Del Toro, the job of bringing the comic book hero Hellboy to the screen was a labor of love—love for comics, and especially for the work of artist Mike Mignola, Hellboy’s creator. Del Toro effectively recreates Mignola’s flair for shadows and big, bulky imagery. This is a comic book world quite unlike any we’ve seen before. We get to know Hellboy through the eyes of John Myers (Rupert Evans), an FBI agent who has been transferred to the mysterious Bureau for Paranormal Research and Defense. He’s welcomed there by a wizened geezer named Professor Bruttenholm (Alien’s John Hurt in fine form). Bruttenholm shows him around this secret government freakshow, assuring him, “There are things that go bump in the night.” Hellboy, the Bureau’s most notorious weapon, is the biggest bumper of all. This massive, red-skinned, horned devil from hell—the most disgruntled comic book hero to reach the big screen since Harvey Pekar—has abandoned the evil powers that spawned him. He’s hard at work as a secret weapon for the Bureau. In his spare time, he consumes mass quantities of meat and carbs, plays with his collection of kittens, and lifts weights. When called upon, he pursues and destroys monsters and supernatural bad guys with an air of obligation, indifference, and sarcasm. Superman said, “Up, up and away!” Hellboy says, “Aw, crap.” Saving the world is a chore, but he gets it done. Speaking of chores, if Hollywood keeps turning out comic book movies at this rate, it is going to become tedious. The thrill of CGI special effects is wearing off. Filmmakers face the formidable task of delivering something original and compelling, something more than just violence, explosions and revenge stories. X-Men and its sequel passed the test with flying colors, offering style and substance. Spider-Man delivered the goods. Hulk was artful, but its finale was awful. The League of Extraordinary Gentlemen flunked. Daredevil was a dud. Here’s the good news: Hellboy and his gilled, web-footed sidekick Abe Sapien are spectacular. They’re two of the most remarkably realized comic characters ever to reach the screen. There is no better actor under heavy prosthetics than Ron Perlman; he’s made a career of it (TV’s “Beauty and the Beast,” Star Trek: Nemesis, The Island of Doctor Moreau). He’s always deserved a movie of his own. Hellboy is his big chance, and he’s brilliant. He is completely convincing as this not-so-jolly red giant, perfectly comfortable performing acrobatic stunts under tons of latex and paint. And he doesn’t over-play the comedy—he under-plays it beautifully. He’s a lonely, soft-hearted, alienated child who bashes his way through to the bad guys and hits them like a ton of bricks. His equally compelling sidekick, Abe Sapien, is a “mer-man.” Doug Jones brings this amphibious psychic with graceful physicality, but the voice is perfectly pitched by David Hyde Pierce (Niles from TV’s Frasier). You’ll believe a man can gill-breathe. But there’s bad news. This dynamic duo is stuck in a dull, derivative, poorly plotted movie. They’re forced to share screen time with cookie-cutter companions. Myers is as compelling as day-old bread. Jeffrey Tambor is a clichéd government jerk. The cops that follow Hellboy around are just idiots waiting to be picked off by the bad guys. Hellboy’s enemies are interesting at first, but they wear out their welcome quickly. The boss, the famously indestructible Grigory Rasputin (Karel Roden), looks like he got lost on his way to a goth party. He’s dull, overdressed, and wearyingly melodramatic. Whenever he opens his mouth, you just wish his annoying blonde girlfriend Ilsa (Biddy Hodson) would make herself useful and shut him up. What’s his motivation? Anarchy? Power? Rebellion against God? This bald brute is responsible for letting Hellboy loose into our world back during World War II, an episode that serves as the film’s prologue. Working for Hitler, Rasputin opened a portal into some hellish dimension, trying to summon the Seven Gods of Chaos. Allied Forces arrived and spoiled his plan before the dangerous deities could RSVP. But one brave Brit, the young Bruttenholm, discovered the infantile imp before Rasputin did. He named him and adopted him. Rasputin has help, two secret weapons that are as hard to kill as their master. Monster #1 is Kronen, a zombie ninja with a clockwork heart. He’s like a walking Ginsu-knife demonstration. It’s likely he went to school with Darth Maul and X2’s Lady Deathstryke. He’s mysterious too, until we see him unmasked as a prime candidate for Extreme Makeover. Monster #2 is the Sammael, a demon built like a hairless lion with a head that’s half-squid, half-beetle. But when he pounces into the open, he’s not scary—he’s just ugly. He’s every exterminator’s worst nightmare: Whenever he’s killed, he replicates himself twice. He’s a “resurrection demon,” you see. This all sounds cooler than it is. Rasputin and Ilsa are posers without personality. The Sammael are just dumb animals for Hellboy to squash. (Aren’t demons supposed to be spirituallyunsettling?) Only Kronen earns our serious concern with his lurking, slicing and dicing. The explosive clashes of good and evil only serve to blow more holes in the plot. Abundant Catholic symbolism adds a sense of importance to these events, but that never amounts to much either. Abe wears a holy relic for protection. Hellboy carries a gun in one hand, rosary beads in the other, and he gets a cross tattoo. But these are treated merely as talismans—good help in a fight, like a bulletproof vest or garlic against vampires. There is no suggestion of what they mean. 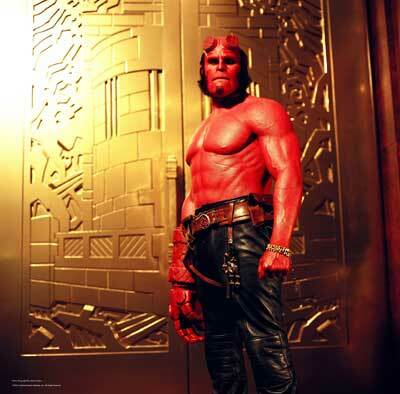 Hellboy regrets his hellish origins so much that he grinds down his horns to look more human. But he’s far more interested in his girlfriend Liz than in showing gratitude to the source of the grace that redeemed him. Disregarding the dumb plot and vague religiosity, it’s Hellboy himself and his love story that keeps the film from falling apart. His true love, Liz Sherman (Selma Blair), isn’t much of a character. She’s basically Stephen King’s Firestarter, an alienated girl with an oh-so-combustible temper. Blair plays her so glamourlessly that she’s almost boring. But we care about her because Hellboy does. His affection for her is what makes him sympathetic. Who hasn’t fallen for someone and felt awkward and unqualified? The best scene in the film comes during an interlude between Sammael smackdown matches, when Hellboy shadows Myers and Liz, determined to ensure that they do not fall in love. He finds himself on a rooftop with an unlikely new friend, and his distress is a wonderful thing. In fact, all of the film’s high points are incidental character moments: a conversation about cigars, the way Hellboy responds when kittens are in danger, witty repartee between “H-B” and a laryngitic half-resurrected corpse. Guillermo Del Toro is a talented director of drama and mystery. 2001’s The Devil’s Backbone is a great ghost story and a sorely overlooked film. But Del Toro does not yet know how to give action scenes a sense of momentum. Through most of the film, Hellboy just trudges along like a dutiful Ghostbuster, chopping up slimy Sammael demons like sushi. The action is thunderous and chaotic, but it never develops the exhilarating thrill of theX-Men films. The big finale wraps up with an anticlimactic trick right out of Men in Black. As watchable and likeable as he is, Perlman’s Hellboy eventually seems as tired of the action as we are. When the film wraps up with some painfully sentimental narration that tries to tell us what this story means, we just want to follow our hero home, watch him play with the kittens, and have some pizza.